Replacing a retiring future Hall of Famer at any position is nearly impossible. What better way to try than to look for an exact clone clone? 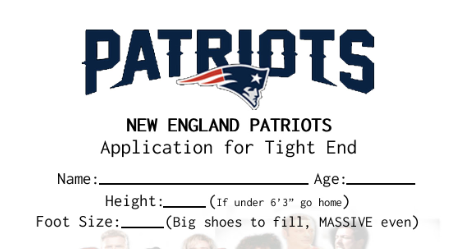 This application for the New England Patriots is perfectly designed to fill the gaping hole left behind in the wake of Rob Gronkowski’s retirement. Obviously for a team that makes stars out of Walmart cashiers and Popeye’s chicken servers it couldn’t be the worst possible move. Finding a fun and charismatic beer crushing party animal will be the easy part, getting him to match the all world skill set of Gronk will be near impossible to find in this lifetime though. 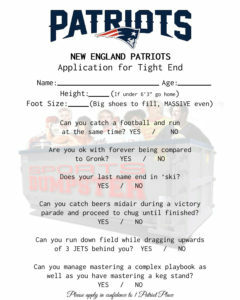 Either way I wouldn’t put it past Bill Belichick to find a First Team All Pro replacement with this method. Belichick is always 2 steps ahead of the rest of the league.